Determine individually and flexibly which stored information should on each call in ProCTI. Access your contact information, service cases, e-mail addresses, current contracts with only one click! 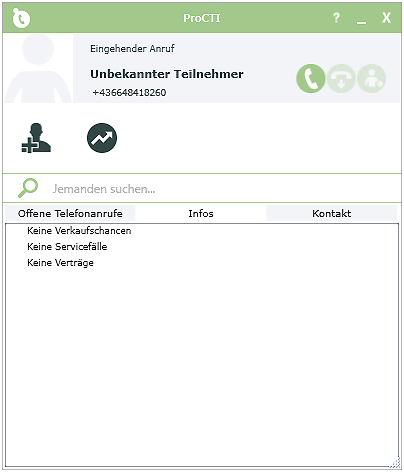 Create leads, contacts, tasks, notes, e-mails and activities in connection with the caller. Initiate or forward calls, see and start your open appointments, search for leads, contacts and companies – everything directly in ProCTI. Pricing Information: Only enabled ProCTI users are counted. A minimum of 5 seats is required. Time-consuming contact management? Inefficient service? Low customer and employee satisfaction? ProCTI puts an end to these problems. Enjoy a 360° view of contact information and the entire customer history for an optimized contact management and customer service. Popular areas of use: Customer hotline, technical support, supplier management, internal sales, etc. Is it possible to use new, individual adapters? Yes. ProCTI offers its own API to create new and individual adapters for connecting new systems and data bases. 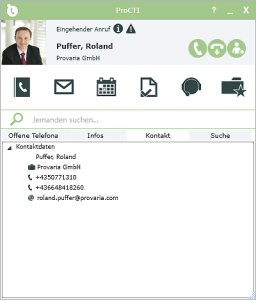 Which telephony systems can be used with ProCTI? 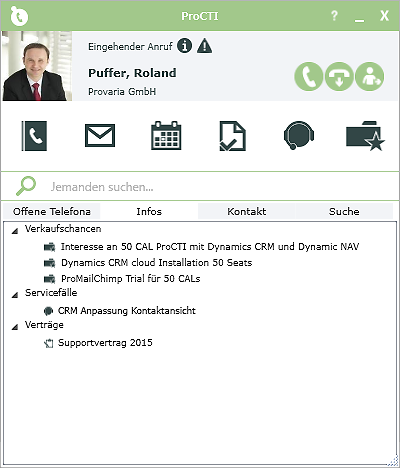 ProCTI is compatible with all Skype for Business and TAPI systems. Is ProCTI available in several languages? Yes. ProCTI is available in all languages available for Microsoft Dynamics CRM. Is cloud operation possible for ProCTI? Yes. ProCTI works in the cloud. 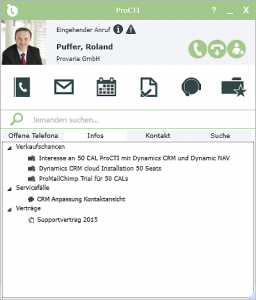 Is it possible to personalize the ProCTI user interface? Yes. ProCTI proves to be a highly flexible computer telephony integration. The user interface can be personalized regarding colour, design, shown data and buttons. Is it possible to display data independently of the user role? If so, to which degree is programming necessary? ProCTI enables individual contact management and displays the contact data from the data base that have previously been defined in the administration area of the data base. Programming skills are not required. Does ProCTI offer the possibility to connect several data bases/systems (Dynamics CRM, Dynamics NAV, Salesforce, SugarCRM, etc.)? Yes. 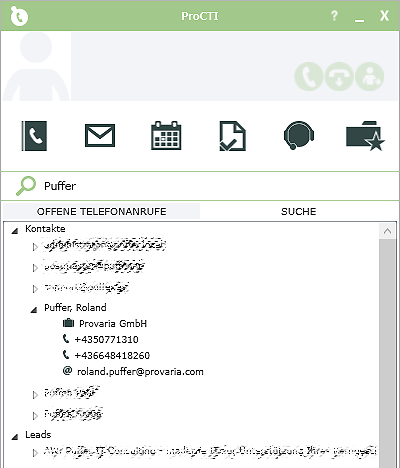 With ProCTI you can connect several data bases/systems to your telephony system.